Yes they are finally here! What we’ve all been waiting for…..jobs in the Coffee Shop! Thanks to ChantelleFurshion we have a detailed guide available with all the Insider scoop! You can follow her guide and check out all the super pictures inside the Bearville Insider forum CLICK HERE. 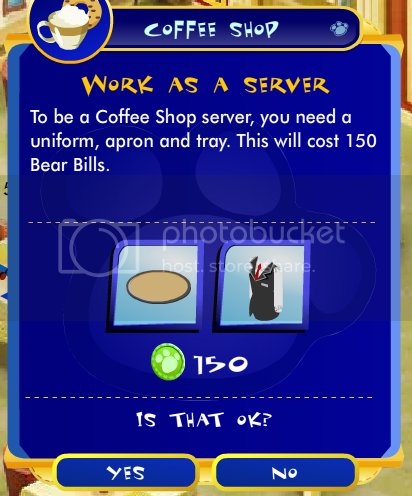 Bearville Insider member aj2hip8931 says "I’m working at the coffee shop right now, I LOOOVVE doing it! The highest bear bills I made was 365! I even got a pic in my avvie wearing my uniform! And I ALWAYS get the 50% off!" Shop Fur All Seasons Opened!!! Previous post: Paws Fur Nature June Issue! Next post: New Party Rooms!